In the summers of 1995-1997, I spent three amazing, magical, life-changing long weekends in Los Angeles. In October of 2018, once my memories of LA were old enough to get drunk there, I returned. These are the stories of my return to the City of Angels. And the sudden drop in temperature. I hadn’t been sunburned in years when I came to LAFF ’95. Once in all of high school, after an ill-advised hike through the suburbs from one side of Nose Hill and back again. That all changed on the day I joined a group trip to Venice Beach. Not that there was any question that going to Venice Beach was the right call. First, it was pure fun, second, either right before we left the hotel or right after arriving at the beach, Peri, one of the female FOLCs in my age range, emerged in the bikini her friend (and now ours) had convinced her to buy. I have worked, in the last two decades, to be a better feminist ally, a great work that has had some stumbles, and which I see as never truly finished. That said. If you are not a blood relation, it is highly improbable I am ever going to say “Yes” to that question. I certainly didn’t that day. It is… a challenge going through life afraid to take up space. Anyway. That afternoon on Venice Beach was one of the weekend highlights, so of course I returned for LAFF ’96, a beach day I recall as The Day I Accidentally Learned How to Flirt. It’s a special place, that beach. So naturally, a nostalgia trip to LA would require a return visit. But there were a couple of stops to make along the way. 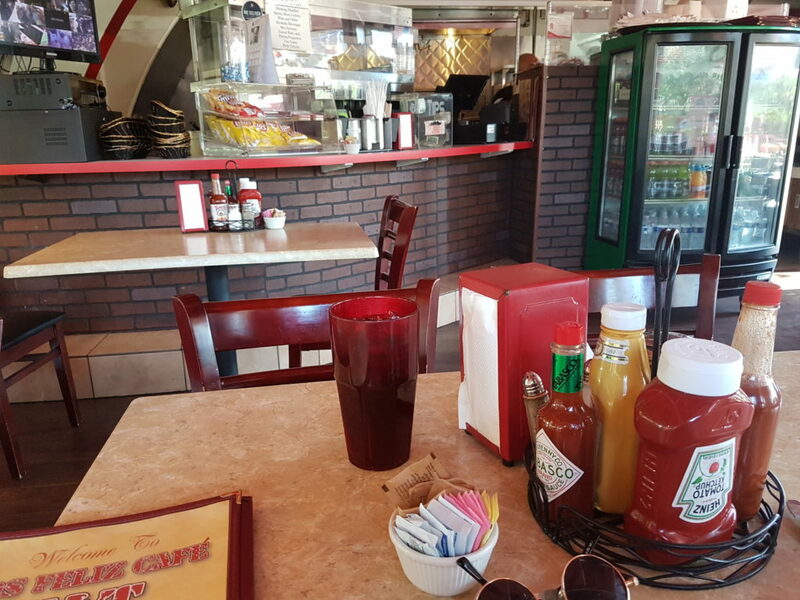 Either you recognize this diner or you need to keep reading. I’ve talked a lot about the nostalgia aspect of my LA visit. Like, right above. A paragraph ago. But that wasn’t my entire to-do list. I wasn’t just going to places I’d been during one of three LA FOLC Fests. No no no. I was also visiting places from stuff I watch. For those unfamiliar, back in the halcyon days before the YouTube bubble burst, killing channels some of us really loved, the most popular video content Cracked.com put out was After Hours, in which four of their funniest people… Michael Swaim, Daniel O’Brien, Katie Willert, and Soren Bowie… hung out in a diner dissecting pop culture until their topic was ruined for all time. It’s gone now. Been over a year since Cracked.com shut down its video department, as YouTube algorithms and Facebook interference and generally realizing there’s less money in YouTube than we thought led to mass layoffs. But even if that hadn’t happened, After Hours was still wrapping up. Soren and Swaim had both left the site. A series finale was filmed but never released, since the person in charge of post-production was fired before it “aired.” That fact angers me to this day. Anyway. The bulk of the series filmed in Los Feliz Cafe. My path was then clear. If I was going to LA, I would have to make a pilgrimage to said Cafe. Get their table if I could. Get Daniel O’Brien’s chair if possible, because Daniel O’Brien is a comic treasure and of all the personae they played in this and other Cracked series, I connected most to his. The second most popular Cracked series was apparently Honest Ads. That baffles me. It wasn’t nearly as good as Daniel O’Brien’s Obsessive Pop Culture Disorder. People. They confuse me. 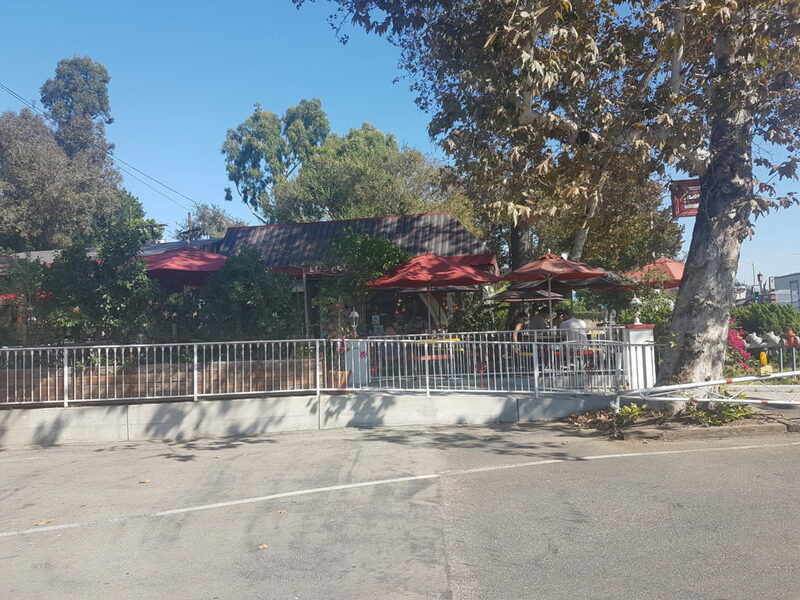 As a bonus, the map I checked seemed to indicate that the cafe was right next to Griffith Park, another entry on my to-do list, and a not-terrible distance from Venice Beach! What a fun day that would be! Turns out I had some lessons to learn about trusting the apparent distance on Google maps of LA. Nothing is that close to anything. Regardless, I made it. Although I did forget to pack three friends to argue pop culture with. And all the other chumps grabbing lunch there were sitting outside, on the patio, in the sunshine, like suckers. Leaving me free to grab the Cracked gang’s table! Look there’s every chance they moved tables around for filming purposes but just let me have this. Lunch completed, it became clear that hiking up to Griffith Park Observatory was not an option. Yes, Griffith Park was more or less right there, but it’s also entirely large hills of loose soil and scrubland. The walkable path to the observatory was an hour, mostly through neighbourhoods, and then really, really uphill for a while. I opted to Uber. It was my driver’s first day on the job but we managed to find our way up. Get your space science on! Next stop, Griffith Observatory. 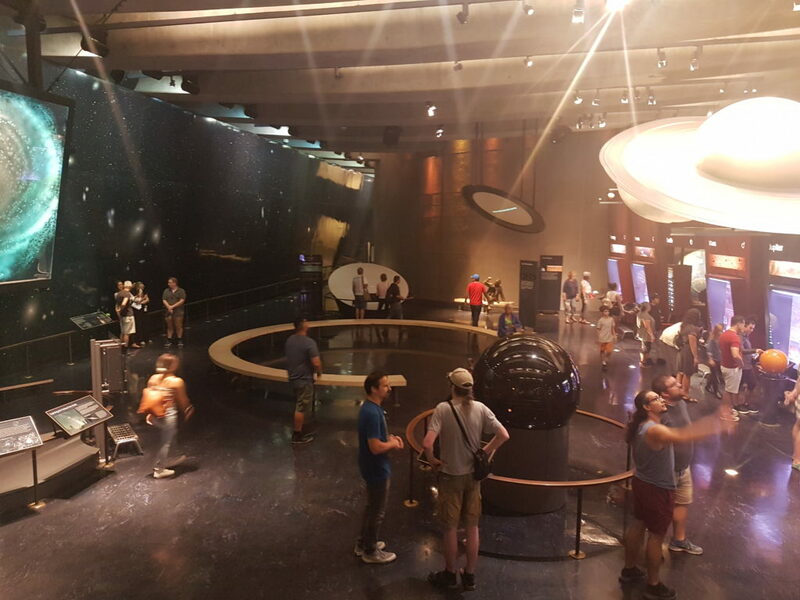 Why Griffith Observatory? It’s a famous landmark. It’s one of the best views of the city. It’s chock full of space science. And the other the endpoint for a lengthy bender between BoJack and an old friend, which I’m not posting anything from, because those who know don’t need a reminder, and those who don’t shouldn’t be spoiled watch BoJack damn your eyes. But, you know… the other stuff. Mostly. Space science. And there was so much space science. One room. There were many rooms. And all of it free. 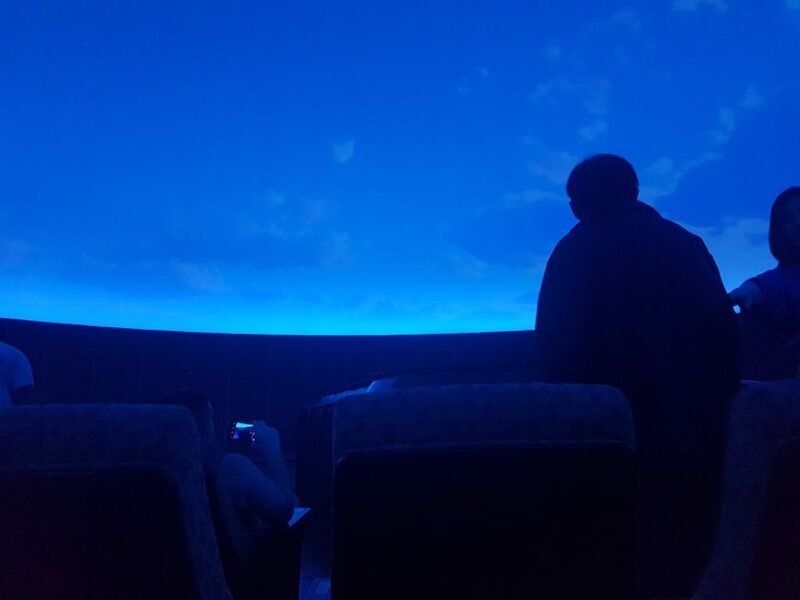 Well, except for the planetarium show, a giant-dome-screen tour of the solar system, the galaxy, the universe, and the history of our understanding of all of these things. Which confirmed my theory that “dark matter” and “dark energy” are science speak for “We don’t know what’s doing this but it has to be goddamn something.” An impressive spectacle with just one minor tragic pop culture connotation. That wasn’t free. It was a whopping seven dollars. I made it fit my budget, somehow. 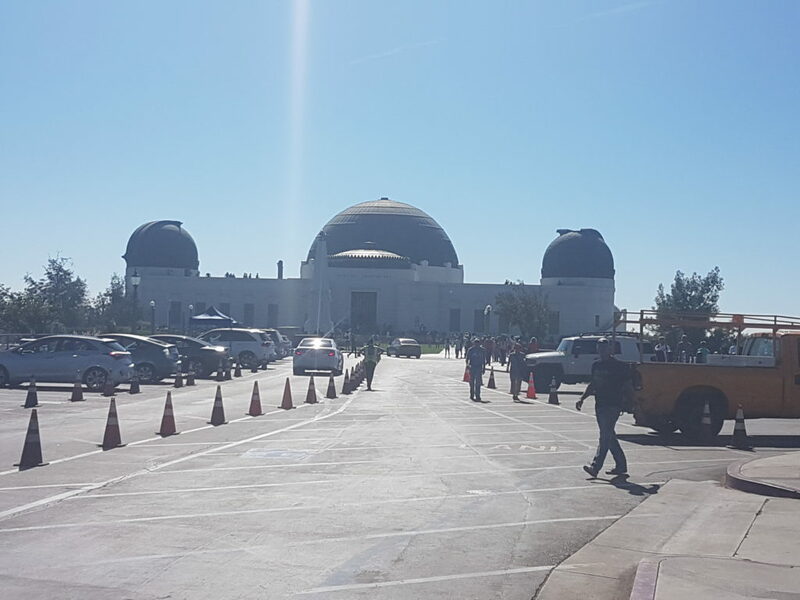 The other advantage of the observatory being free of charge is that if there’s a bunch of other things you want to do before sunset and it’s already like 2:30 and everything in LA is so goddamn far from everything else in LA, you don’t feel guilty about maybe just browsing a few of the exhibits. Upon arrival, my Uber driver told me that there was a hiking trail from the observatory right to the Hollywoo(d) sign. That sounded neat. So for the first time that week, I put water in the water bottle I’d been carrying around for three days, started towards the trail sign… and saw exactly how long a walk it would be to the sign. Four miles. In the fairly hot sun (high 20s, near 30 Celsius?). And this was not meant to be my last stop before sunset. I was still hoping to hit the beach, which was an hour drive from me because everything is an hour drive urban sprawl is a nightmare. So, a hike through the hills of LA to stand near a sign, or Uber to the Santa Monica pier while it was still a lovely day out? And the pier full of fun. Ha! “Highs and lows” referred to geography, not a blend of discovery, triumph, and the crushing realization that the past can never be recaptured, time’s arrow relentlessly moves ever forward, and those golden days on Venice Beach feel so far away it seems like another life for a reason! Yup. Just geography. The only highs and lows we’re covering. 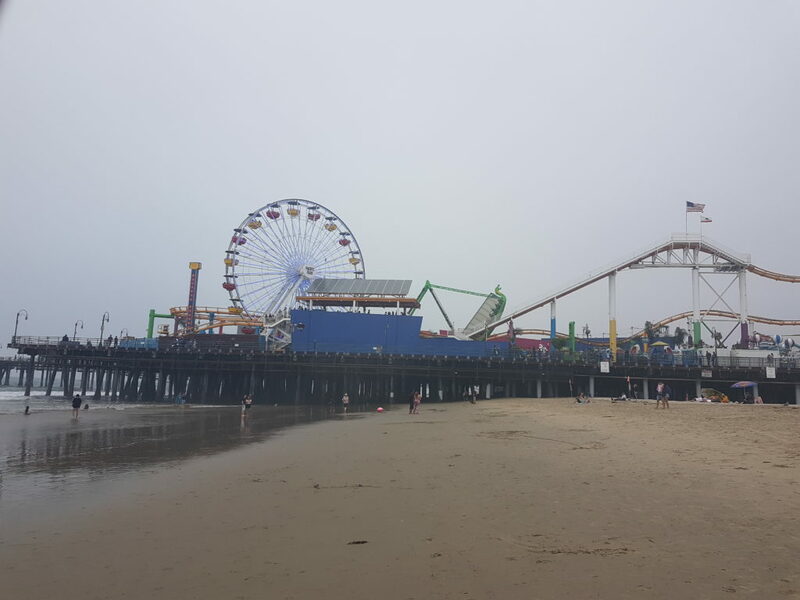 My plans for the beach were two-fold… see the Santa Monica Pier, which I never had before, and then maybe try to find the spot on Venice Beach where the FOLCs and I once hung out for two wonderful, burn-filled afternoons. And I suppose also lounge on a beach, if possible? I did pack a swimsuit just in case. So, three-fold, I suppose. I’d picked Saturday for all of this because while a Saturday afternoon was, to my estimation, the worst possible time to be at a theme park, it seemed a great day for people-watching on the beach. The sun was shining, the Uber ride was under $20 despite the distance, everything was set for a great day at the beach! And then as soon as I hit Santa Monica clouds rolled in and the temperature dropped ten degrees. In one car ride I went from hot and sunny to grey and very nearly chilly. I damn near regretted wearing shorts that day. That’s… that might not be accurate. 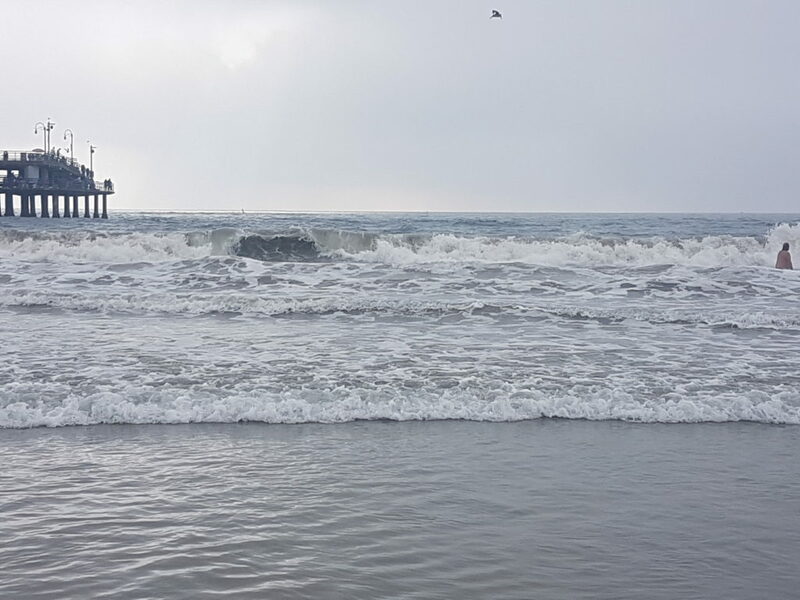 I remember thinking “Well the weather sure turned on me” but not “I am actively cold.” Even after wading into the water by the pier, because I did not come this far to not at least set foot in the Pacific. Didn’t attempt any rides. Maybe buying ride tickets individually made the roller coaster and similar pier rides seem more expensive than they were. Maybe four straight days of theme parks made the pier rides seem less appealing. Whatever the reason, I just looked around and got an ice cream before starting my walk south along the boardwalk, in search of our old spot. Which was a pipe dream and I should have known it was a pipe dream. The thing, right, the thing about Venice Beach is that there is miles of it and it all looks like beach. Meanwhile, the boardwalk is a series of essentially identical stores selling the same slightly risque t-shirts and underwear. I only sort of remember some of the people who were with me those days, what chance did I have spotting one stretch of beach? I guess I remembered being near one of those muscle beach gym areas, and thought that if I could find that, I’d be in the general area. But the sun began to set, the night began to shine fall, my feet began to protest, and my priority shifted to finding a decent-looking place to have dinner while I waited for Uber prices to drop down from rush hour surge rates. The place I found was attached to, and themed after, a second-hand bookshop. So, decent choice. On my last day in LA, having weighed my options, I came to a conclusion. That conclusion was “No more hour-long Uber rides, they’re adding up.” I had not considered going back to Catalina Island until late Saturday, too late to book a tour with a shuttle to the ferry. But Disneyland was right there. I could see the Incredicoaster from outside my room. And if I stuck to one park, it was not much pricier than round-trip Ubering to the far side of LA and paying admission for… whatever. Or for a ferry ride to and from Catalina. And so back I went. But there was one final burst of unexpected nostalgia. As I made my way through not-terrible Sunday crowds, using the app to acquire fast passes (I paid the extra ten bucks to be able to do that, well worth it), I couldn’t help but think back to the previous week, when I was here with my family. Lining up for Space Mountain, I remembered how much Dara loved it. Riding Alice in Wonderland, I wondered if she’d have enjoyed it as much as the 100 Acre Wood. It was still fun. I had a good time. The sandwich place in Downtown Disney where I got dinner as I said goodbye to the park was very tasty. It just all felt a little bit hollower without Mom and Dad and Dara there with me. I guess the happiest place on Earth is no place to be lonely. Krusty Burger. Bonus points for including the ribwich, a couple of points deducted for not including “The One With Ketchup.” But, fine, they all have ketchup, they couldn’t actually make Krusty Burgers as comically unpleasant as the show sometimes suggests. It was a decent fast food burger. A Carl’s Jr level burger. Duff Beer, available at Moe’s or Duff Gardens. For an American beer served at a theme park, it was a passable beer. Not too hoppy, not too weak, it wouldn’t be my go-to if it were available here but perfectly drinkable. Lard Lad giant donuts. This… this was a bridge too far. The donuts were the size of a pie. This was a donut to be split among four people. Certainly not a donut to be tackled solo not long after a fairly filling lunch. I’m not even convinced I ate any of it at the park. I just threw it in my bag, hoped it would survive the trip back to the hotel, and saved it in my hotel fridge as an end-of-day treat for the remainder of the trip. The Universal backlot tour was supposedly “hosted” by Jimmy Fallon… meaning he recorded two videos of a combined length of about a minute and a half. One intro video where he threw things over to the actual guide, and one black and white video of him supposedly juggling, to play when we drove past a hot set and had to be quiet. The Warner Bros. tour, on the other hand, featured multiple video appearances by Ellen Degeneres. Sure she was clearly in front of a green screen but she “hosted” the tour/museum experience in a way Jimmy Fallon couldn’t be bothered to. Or maybe they just cut all of his material? Either way it’s a weird choice. The hosts of Lucha VaVOOM kept up the audience’s energy with call and response: any time they shouted “LUCHA!” we were to respond “VAVOOM!” They would also do this any time one of their jokes flopped. I misjudged who was the face and who was the heel at least once during Lucha VaVOOM, but in my defence, the intros were in Spanish, and if someone’s entrance/ theme music is the opening titles to Doctor Who, I’m gonna assume I should root for them. I visited the Toon Town area of Disneyland for the first time on that final Sunday. Don’t… don’t actually have much to say about it. The ride was okay. I forgot it on the list earlier. Maybe that’s its review. Night one of Disney we caught their big show Fantasmic, in which Mickey Mouse goes on a tour of imagination, aka every property they can wheel out, be it through projections or puppets or actors doing dances or acrobatic pirate battles on the river. It shouldn’t be that easy for a pirate ship to sneak up on someone. Next time… we begin to shift from LA to NYC.